TARJA: The idea of performing live with a symphonic orchestra, choir and Mr. Terrana on drums was originally mine. Mike has done a recording with drums over classical pieces that I think it is great. I could imagine it on a stage with a real orchestra as a part of a bigger concept. I believe this kind of combination of instruments, particularly playing mainly classical music, is very unique. I have been making collaborations with orchestras before and I could foresee a great outcome. MIKE: I had the idea to record a version of the “1812 overture” as a tribute for Cozy Powell about 4 years ago. I enjoyed it so much that I decided to record a whole CD of classical tunes, which become known as “Sinfonica”. the mixture of powerful rock drumming with classical music. 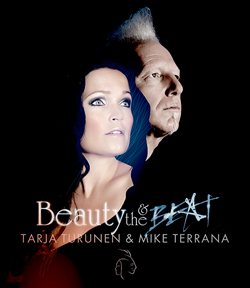 One day during a break from the road, Tarja and I were discussing our interests in classical music and opera and we decide to put together a show called “Beauty and the Beat”. It seemed natural enough, because Tarja is very well known for playing classical concerts on her own; I however was new to the classical world and being a self taught rock drummer I was not sure how my drumming style would fit in with the orchestra. After we finalized the concept we decide that we needed to do a test show just to see if it would work live. Fast forward to Bulgaria 2011, we were booked to perform to a full house in a beautiful ancient amphitheater. HOW DID YOU PREPARE FOR THE FIRST SHOW? MIKE: To prepare for this first show we did 2 days of rehearsal with the orchestra, which in the beginning was not so easy for me. This show was to be the model for all of the other shows on the Beauty and the Beat tour to follow so it was very important for us. TARJA: I was training vocally hard during many weeks before the first show. I also took singing lessons with my vocal coach in Buenos Aires to make sure that I was in the correct track. I needed to find new clothes for this show as well, so I trusted the local Argentinean designers for it. I sent the scores that I had for the orchestra and choir in advance, so they had the material in hand before the real rehearsals started in Plovdiv with Mike and me. The orchestra had been rehearsing the songs alone without the soloists for some weeks. When we arrived to Bulgaria, we had two days of rehearsals with them. It was very exciting for all! We realized during the rehearsals how demanding and challenging the actual program is, but we all enjoyed the challenge. I talked with the conductor all the tempo issues in each of the songs in advance and made sure that we were all in the same page. TARJA: For me it is rather impossible to sing classical music with in ear monitors or a handheld microphone, because I want to hear my natural voice and also I want to have my hands free while singing. In these concerts I used two wedges where the monitor engineer mixed the instruments from the orchestra that were needed in order for me to hear the tuning and tempo properly. Also I had my voice with some reverb in the wedges. For the classical pieces I used a microphone that is designed for this type of performances, brand called Schoeps. It is a microphone that I am not holding in my hand nor it is very close to my mouth, but instead is on the stand more or less 30 cm away in front of me. A handheld microphone I used in the rock songs in order to get more definition in the voice. The volume of my voice is rather lower in those songs comparing to the classical pieces. It was always a challenge in these concerts to get the monitor sound fixed in the sound checks, but that is what sound checks are designed for! I had to plan carefully the set list and running order for these concerts. While we needed to keep the interest of our audience it wouldn’t get too difficult for me to sing. It is vocally very challenging to make the changes between classical pieces and rock ones. I was glad to have the chance to relax and concentrate into my following pieces at the backstage while Mike was performing his solo numbers. MIKE: First of all acoustic drums are very loud, so I had to adapt my drum tuning and playing style for the dynamic level of the orchestra, this involved tuning my drums lower and using tape to dampen the toms and snare drum. I also had to be very aware of my striking power when playing. You cannot play acoustic drums with the same intensity with an orchestra as you would with a rock band. This took some time and practice. It was also technically complicated to get my in ear mix correct for this kind of project. All the instruments were mixed and then divided into sub groups that were sent to my mixer. Its very important to have a good musical and dynamic balance between all the orchestral instruments, otherwise you don't hear the piece in its correct form, making it difficult to play along. All of these variables had to come together perfectly so that I was able to play and perform the pieces to the best of my abilities. A task easier said than done; however I have always enjoyed a good challenge and I enjoy playing all forms of music. I believe it’s important as artists to push ourselves into different areas in order to grow and to evolve. I must say I learned a lot about music, myself and from the classical musicians and conductors involved with the Beauty and the Beat project. It was really interesting and fantastic experience and I hope to do it all again in the near future. MIKE: We are very fortunate to be able to rehearsal and record the DVD in the Convention Center, a very beautiful new venue in Zlin Czech Republic. The orchestra and conductor were professional young open-minded people so we were off to a very good start. There were two days of rehearsal scheduled with the orchestra and choir before the taping of the DVD. We also added some new pieces to the show, among them a medley of Led Zeppelin, so it took some time to work out the transitions from song to song. All 3 shows were sold out and the 2nd show was recorded for the DVD. I was a bit nervous before the show even thought I have made many DVDs before, but never with an orchestra. I was also singing, which is also something I am not normally doing with the rock bands I play with. So I remember just sitting in the dressing room, alone and thinking: “you really going to do this”. And well… I did! It’s also not so easy to play drums wearing a suit and tie. Many jazz drummers in the past used to play in this style. Now that I have completed 15 shows playing drums in a suit I have a new found respect for them.